The Saturday of Lazarus and Palm Sunday precede and foreshadow the events of Holy Week. In addition to showing Christ’s divinity, the feast of the Resurrection of Lazarus is a prophecy of the resurrection of Christ and all the dead for all time. The events of Holy Week are overwhelming, but in the end, the light of Christ prevails. There is hope! He is truly worthy. One never knows what ripple effects these words, actions and example will have on the rest of us in different Metropolises and Jurisdictions. 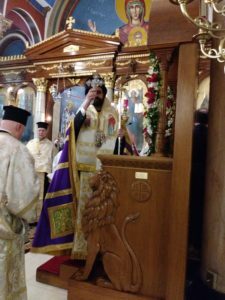 We pray he will be careful in selecting people who honestly care for the Orthodox people of the Midwest when he chooses his staff of this sacred Metropolis. It is well known that scandals abound and transparency is an unknown quality in Chicago. Let’s hope new Metropolitan does an honest job overseeing its clergy & churches are Holy — not secular corporate club houses. Let’s hope he defends Jesus name in public forums unlike Archbishop Demetrios at Trump’s Presidential Inauguration when he did Not mention our Lords name — how PC of him — but Evangelical Paula White did! What’s going down with our Orthodox clergymen?? ?